At only 12-years old, Joshua Flores is already a force to be reckoned with. He hails from Corpus Christi, Tx and has performed at countless shows, events and fundraisers. 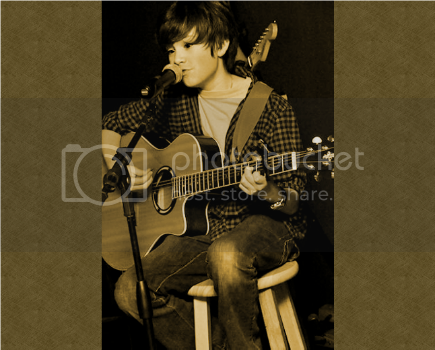 Joshua is a singer, songwriter and performer and is definitely on the rise to fame! When asked what his objective is, he replied “To share my gift with the world.” Check out this Exclusive One-On-1 Interview with Joshua Flores! Thanks for talking to me Joshua! I’ve been following your singing career on Youtube for a while now, and you are insanely talented! Now, you’re only 12-years old, so when did you decide that you would like to pursue music professionally? I realized that music was something that I wanted to do on a big scale when I was about 8-years old. I sang for the first time in front of a crowd at my First Communion Mass. After that, I knew I could sing in front of people and everyone told me that they couldn’t believe how I sounded. I guess I didn’t look like I could sing the way I did. I guess? Well, I understand that! 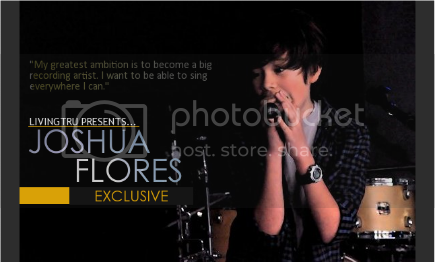 Considering how talented you are, it would be hard to believe that such an amazing voice comes from such a young kid. So Joshua, how do you balance school with your music? It’s not that hard to balance my singing career with school. I do get all A’s and I do have to practice a lot, but I like to do it. Since I like to perform, it’s not that big of a deal to practice for an event. I really like to read so, school is not as bad as you might think, for me. All A’s? That’s awesome! You must have a strong support system backing you to be able to stay on top of everything. Does your family support your decision to pursue music? My family does support me in my career. My dad gets a lot of gigs for me and since he is a Music Director for the church we go to, I play at Mass with him every Sunday and it’s giving me a lot of experience. My mother is an administrator for our school district so, I get to sing for a lot of city wide events, too. That’s awesome! You mentioned that your Dad is a music director for your church, so I take it that you have a religious background. What role does God play in your life? Well, God plays a big role in my life because both of my parents are really involved in church and have been for all of my life. My father has been music director for different churches and my mother is in different ministries at our church. I have also been an alter server, but I stopped when I started playing and singing at church. Cool! So, if given the opportunity, which Artists would you like to collaborate with musically? The artists I would love to work with is the late Michael Jackson, Justin Timberlake, Maroon 5 and many others, it’s hard to pick a few. The Christian artists I like are Casting Crowns, Chris Tomlin and Mercy Me. I’m a big fan of MJ as well, and I love Chris Tomlin! You’ve been doing music for a few years now, what has been your biggest moment thus far? My biggest moment so far has been…Well, there has been a couple. The first one has to be when I sang with the American Boychoir in Princeton, New Jersey. We got to sing with the New York Philhamonic at the Lincoln Center in New York. I also got featured on a National Syndicated radio show. Both of those were big moments for me. That’s so great, and I know you have many more big moments to come! You seem so mature Joshua, what keeps you so motivated and focused? My parents are what keep me going in everything I pursue. They tell me that I have the talent that God gave me and the belief in myself to do whatever I want. They’re absolutely right. I won’t keep you for too much longer Joshua, I just have a few more questions for you. Do you have anything big and exciting coming up in the near future? Well, the biggest thing is that I am going to audition for America’s Got talent in February. I am also working on a new CD project, but that might be a while before I can get that done. Great! I’ll definitely be on the lookout for both! What advice would you like to give to any kids out there, wishing to pursue music professionally? The advice I would give to someone my age is to make sure you really want to sing, and tell your parents that you want to sing, so they can support you and just practice as much as possible. Practice makes perfect! Alright, this is the last question I have for you Joshua. What is your greatest ambition? My greatest ambition is to become a big recording artist. I want to be able to sing everywhere I can. Thank you so much for your time Joshua! I had a blast talking to you! Everyone be sure to check back frequently for updates on Joshua Flores! Also, be sure to connect with him on all of his social networks! Check out Joshua Flores singing "This Is How We Do It" by Montell Jordan! Also, Subscribe to his Youtube channel to check out his other videos! Great interview with a charming and very talented young man! I was privileged to introduce Joshua Flores on my site back in July and I must say it's been amazing to watch his vocals just get better and better. I'm very happy that you did this interview and we are supporting Joshua all the way! I just know he will be a big star some day! Congratulations Joshua on a great interview!